California is a community property state, meaning a husband and wife each own half of all the property and assets acquired during their marriage. Marital assets include real property, personal property and income earned during the marriage. Debts acquired during the marriage are considered community debt subject to division in a divorce settlement. California law says that all property acquired during the course of a marriage is community property, unless there was an agreement prior to the start of the marriage that stated otherwise, such as a prenuptial agreement. Both spouses have an equal interest in bank accounts and cash assets, even if one spouse earned no money during the marriage. Houses, cars and other property are considered jointly-owned, regardless of whether or not the deed or title to the property is in one spouse's name only. In California, separate property is recognized as such only if it conforms to very specific guidelines. Property owned by a spouse before the marriage remains separate property in the event of a divorce. Property acquired by gift or inheritance during marriage by one spouse is considered separate property. In addition, profits from separate property can, under some circumstances, be considered separate. Separate property is sometimes considered community property under California law. Separate property that is commingled or transmuted is treated as marital property. For example, inherited money that is deposited in a joint account and used by both parties throughout the marriage is no longer considered separate property because it has been commingled, or mixed, with marital property. The intent to keep the inherited property separate has been negated; thus, the inheritance will be treated like community property. 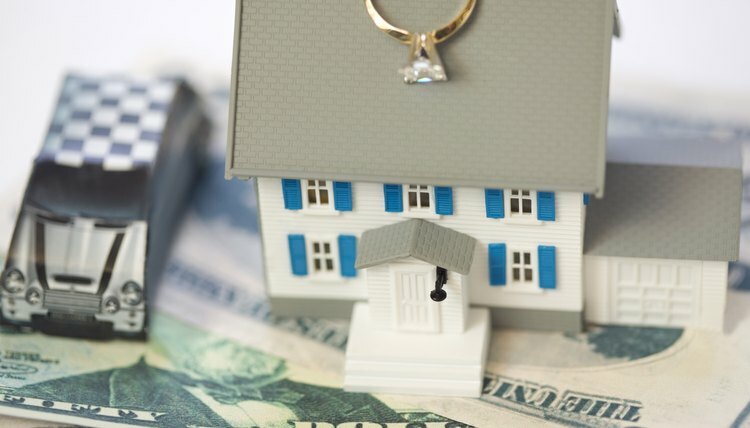 Additionally, if one spouse owned a house prior to marriage, but both spouses assumed title and contributed to the mortgage, the property might be treated as community property because it has been transmuted. Debts are considered in the division of community property during divorce in California. California law states that debts acquired during marriage are considered the responsibility of both spouses; therefore, they are community debt. Debts incurred prior to marriage are considered separate debt. Unsecured debt taken on during the marriage is generally divided equally. Can a Wife Take Assets in a Divorce That Were Owned by the Husband Prior to the Marriage in Ohio? Florida is an “equitable distribution” state, which means a couple’s marital assets and debts are divided equitably in a divorce. However, an equitable distribution does not necessarily mean an equal distribution. Florida does not consider certain debts to be marital debts divisible by the court and creditors are not bound by the terms of a divorce decree. Is Inheritance a Marital Asset in Florida? If you are getting a divorce in Florida, the property you and your spouse own together -- the so-called marital assets -- will have to be split. Whether or not an inheritance is considered part of the marital assets depends on a few different factors, including whether the inheritance was left to one or both spouses and whether the inheriting spouse kept the inheritance separate or commingled it with other marital assets. California is a community property state, which means the law presumes all property acquired during the marriage is owned equally by both spouses. As a result, the court will divide marital property equally if spouses later divorce. The length of your marriage does not affect the division of assets and debts. However, it is relevant when determining spousal support. How Is Debt Split in a Divorce in California?